YAY for THORNHILL!!! I am soooo ready to read this book! I actually read HEMLOCK only a few months ago -- no reason that it took me so long other than I'M SLOW -- and completely fell in love! It was great writing, a really good mystery, lots of tension, a tough independent heroine, swoony boys, and great (and scary!) paranormal elements too. But one of the things I loved BEST about it, and which took me by surprise, was the sense of social commentary it had -- it wasn't preachy at all, in my opinion, but there was definitely an exploration of class, race, difference, being the "other," prejudice, and issues like that. I thought that aspect of the book was SO WELL DONE, and I applaud Kathleen heartily for being able to pull that off. I certainly don't have anything against books that are JUST fun reads, but I especially like and admire books that are great reads AND really make you think about important issues. So, I really, really loved HEMLOCK and am so excited for THORNHILL! I would love to win a copy and have my fingers crossed for that grand prize first and foremost...but I won't turn down some great swag, for sure! ;-) Thanks for being part of the tour! 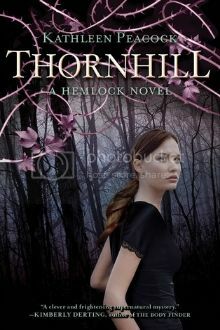 THORNHILL has the most gorgeous cover. This is a world I have yet to explore.